27 March 1963 saw the publication of Beeching’s report “The Reshaping of British Railways,” which made the closure of the rail line to Bideford one of its recommendations. Thus, 2 October 1965 saw the last passenger service leave Bideford Station, severing a major artery into the town. As some demand remained for occasional freight specials, the odd train still used the line, primarily for the transport of clay. 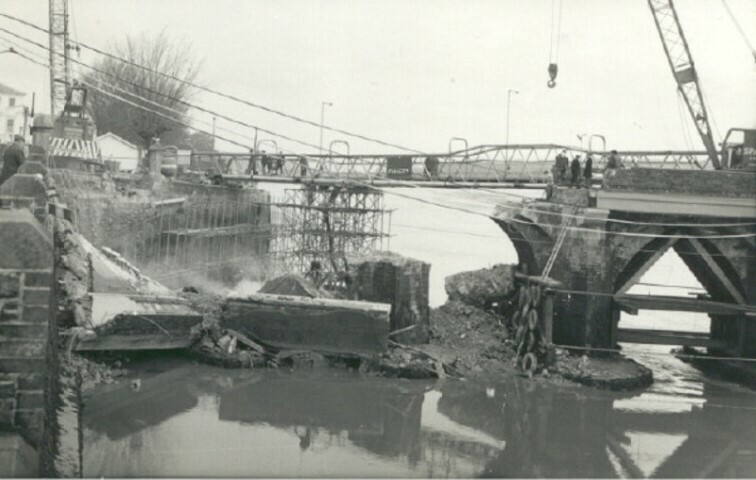 On 9 Jan 1968 the two halves of Bideford were effectively severed when flood-water in the Torridge caused the collapse of the western end of the Long Bridge. A casualty of this incident was the transatlantic telephone cable. In 1963 AT&T had laid their third transatlantic telephone cable (TAT-3). The appears to have run through East-the Water, across the Long Bridge, and on to plunge below the Atlantic at Widemouth Bay, it continued in service until 1986.